The plan area for Stuttgart 21 flanks the axis of the Nesenbach valley, which is largely dominated by winds parallel to the valley (southwesterlies and northeasterlies together have a frequency of 34 %). The canalisation of the wind direction in this valley is mingled with a circadian wind system and this leads to a predominance of southwest winds (with an average frequency of 38 %) due to cold-air flows and a resultant mountain wind during the night. This shows that the Nesenbach valley is the main axis for fresh air supply for the inner city situated between Heslach and Bad Cannstatt. The Kriegsberg hill, projecting in the Nesenbach valley close to the main station, and the opposite Uhlandshöhe vantage point narrow the valley considerably. It is mainly in this region (plan areas A1 and A2) but also in plan area B that high and voluminous buildings would obstruct the fresh air supply parallel to the valley. What is easily conceivable in plan area A1 and A2, however, is extensive, dense and relatively low development. We can only speak about the heights and arrangement of the buildings reconcilable with urban climate when the analysis of all outstanding data will be completed. An eaves height of 20 m, mentioned in the outline for the framework concept, seems to be a realistic approach. The corresponding model calculations allow for a comparison between different concept variations on a comparable basis with regard to their implications on aeration. Today's railway property ahead of the main station as well as the parcel post office, engine shed and holding sidings represent a terraced interference into the natural topography of the Nesenbach valley. Artificial construction material is predominant here and the soil sealing map shows that the ground is sealed to a a very large degree: more than 90 % at the cargo station and main station (plan areas A1 and A2) and between 76 % and 90 % at the remaining railway tracks (plan areas C1, C2 and B) (CITY OF STUTTGART, 1989). From the meteorological point of view, the railway tracks not used for structural purposes differ in a positive way from the sealed building areas, squares and circulation areas despite their lack of vegetation and natural surfaces: The ballast bed of the railway tracks allows for the seepage of precipitation, which contributes to evaporation. The territory has relatively few obstacles and offers only little resistance to wind flow. Even if the number of days with thermal stress (perception of sultriness) within the railway property equals that of the inner city and is only lower in areas with prevailing vegetation, the railway tracks cool down more during the night than the built-up areas in the city and they interrupt the urban heat island between the inner city and Bad Cannstatt in combination with the castle gardens and Rosensteinpark. As studies carried out by the German Meteorological Service have also proved, the microclimate of railway tracks resembles more the climate of open spaces than that of urban built-up areas. This fact is advantageous for the fresh air supply of Stuttgart's city basin through cold-air flows during the night. An intensification of the development (within plan area A1) and the conversion of railway tracks into development areas (within the remaining plan areas) always lead to an unwanted temperature rise (urban heat island effect). In order to prevent a worsening of the existing thermal stress in Stuttgart's city basin (with a high number of sultry days), it will be required to provide for compensation areas, especially within plan area B, which are to be added to the adjacent Rosensteinpark and the narrow stretch of the castle gardens. For this purpose, the transition area between Rosensteinpark and castle gardens near Ehmannstraße seems suitable, and this area is also supposed to open up for a local fresh air supply from the Neckar valley. The vegetation area required for a reduction of the thermal implications of a planned development as well as the greens in the building areas themselves can only be quantified in follow-up analyses on the basis of definite urban development concepts. What can be claimed by now is the necessity of the greening of roofs and facades, an intensive greening of unbuilt sites and an efficient linking of the gained green spaces to bigger inner city green spaces (Pragfriedhof cemetery, castle gardens, Rosensteinpark, the territory of the IGA garden show). 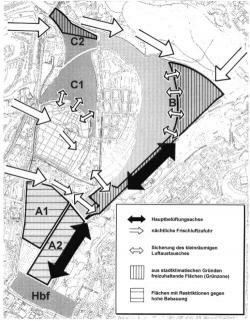 It is particularly important to create a compensation area in the southwestern part of plan area B, which will not only lead to an extension of the park but also to a tighter link between the Pragfriedhof cemetery and the castle gardens and thus to a better chance of local air exchange. If this area was built on, however, the Pragfriedhof cemetery and the castle gardens would be even more closed off than they are today. As thermal discomfort or sultriness during the summer are mainly the result of lacking ventilation in times of high solar irradiation, what we have to consider is not only the gaining of compensation areas but also aeration aspects. In this context, the possibilities of local air exchange through cold-air flows (downslope winds) during the night are particularly important. - the Wartberg-Klinge/Steinberg-Klinge cleft (in the axis of Killesberg - North station). The third above-mentioned opening for fresh air continues along Ehmannstraße until the lower castle gardens as the former Störzbach valley. It is important to reverse the structural interventions here (Rosenstein depot and parcel post office) and to fully reactivate the Störzbach valley as an opening for fresh air. This claim also requires a greater permeability of the railway embankments that cross the valley near the North station. Air hygiene in the plan area for Stuttgart 21 is relatively favourable as the area itself has a low emission activity and moreover borders an emission-free park and hillsides in the north of Stuttgart that are also favourable. However, the area under consideration is surrounded by heavily frequented roads. It will be a question of developing the new building area efficiently without enlarging high-immission areas into the plan area. Only few air pollutants are released in this area today - and it is important that it will stay like this. But this can only be achieved with an emission-free energy and heat supply in this area. Measurements and calculations of the ambient air concentration of air pollutants along the roads (see chapter 7) show that, especially with regard to the plan area, there are higher concentrations at Heilbronner Straße and partly at Wolframstraße. This has to be considered during the development of plan area A1. For air supply reasons, we must refrain from a seamless development of the roadsides at Heilbronner Straße and Wolframstraße. The analysis of the urban climate conditions for Stuttgart 21 has not been completed yet and this is why we cannot give a final evaluation at the moment. The map in figure 9-1 represents only a preliminary implementation of the requirements of urban development for the planning.